Feder Knives specializes in making custom knives to build exactly the blade you are looking for. Please submit your request below and we’ll get you any information you are looking for. All knives include a form fitted kydex sheath and unparalleled enthusiasm for you to use them with zeal. 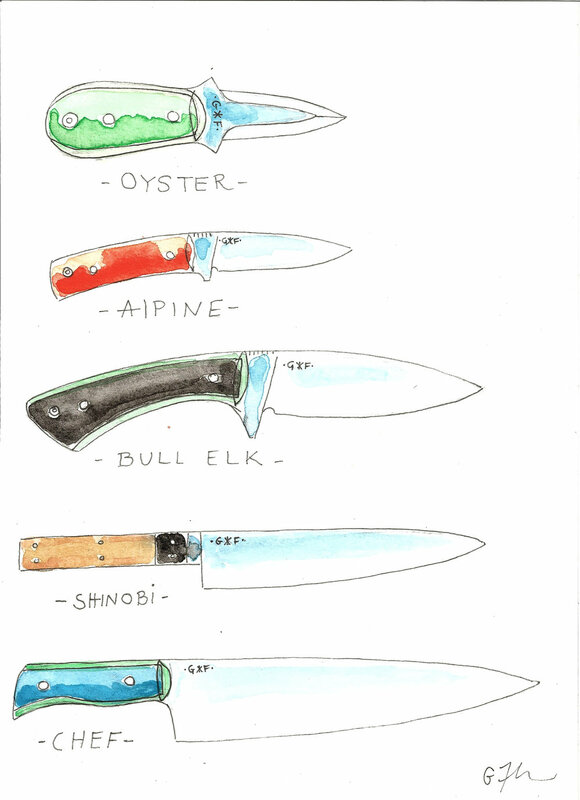 Let us help what style and kind of knife you'd like, from culinary, to "bushcraft" - camping/hunting to special use. We are available for any questions you may have about. Give a look at our Instagram feed to see much of the current and past work we have done. After we zero in on the overall profile of your knife, we start to zero in on some of the final design details such as metal types, forging method, handle colors and materials and file work. Lots of variables to make a truly unique and one of a kind knife. As your knife is made-to-order you will receive photo updates explaining the what's, when's and why's of the knife making process specifically as it relates your knife. This by itself has been a quite popular and creates a kind of relationship with your blade before it even gets to you. Templated Design (‘product removal’) is billed at $40 / inch. Full tang knives are calculated by the over all inch, while hidden tang knifes are calculated by the blade inch + $75 for the ‘standard’ handle. There are quite a lot of options in our standard selection of handle material, in both wood and synthetic materials. There are also lots of ‘unique’ material options for an up-charge which can range anywhere from +50 to +150 buckaroonies. Hand Forged high carbon steel knives only. These are billed at $60 / inch, both hidden tang and full tang options are available. ‘Integral’ style hand forged knives are billed at $75 inch (minus tang) + handle (only available in hidden tang). Pricing quoted above does not include any shipping and handling charges and sales tax if you are in New York State. Let us know what you be looking to have us make for you. Something you saw on instagram, a remake of your favorite knife that is getting too long in the tooth, don't know? Anything goes. Pie is better than cake. What style of knife build are you looking for? Thank you! Your request for a custom Feder Knife has been logged. Please bear with us in response time getting back to you. Interest in our knives has been as plentiful as it is awesome. We handle all requests in order of when they were made so we’ll be getting back to you just as soon as your name comes up.